Leslie's Loops Craft Corner: Where have I been?? July... that's the last time I've updated the blog. I'm going to try to do much better. 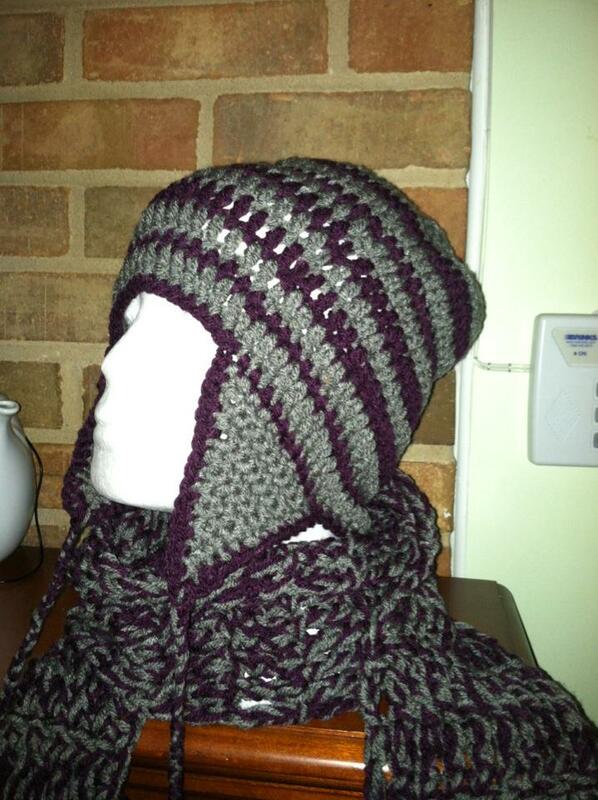 Hat and scarf I made for a male friend. I made mittens as well, but I didn't post them... I got the hat pattern from Ravelry. Click here for the pattern. The scarf pattern was from All Free Crochet. Click here for that pattern. I found that both the hat and scarf pattern works better with very soft yarn. I tried with with Red Heart Super Saver yarn... it works, but they are pretty stiff. 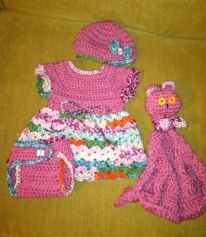 The dress and outfit was for a friend's baby. I unfortunately don't remember where I got each piece of the pattern from. After searching all over, I found the best yarn for it at Hobby Lobby. The color of the variegated yarn is a great girly autumn color. Most autumn colors are more for boys, but this one was perfect. This is the owl that almost wasn't. I had so much trouble putting the two balls together. 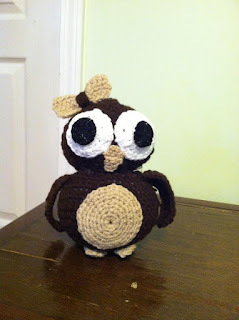 First time I did it, it looked more like a peanut than an owl. I didn't follow a pattern for this, I just made two circles, made round pieces for the eyes and tummy (the black part of the eyes are buttons, and made narrower earflaps for the wings. I had trouble sewing ears onto the owl, so the ears (very small earflap triangles) became feet, and I made a bow by crocheting about 5 rows sc and wrapping a string around it. The beak... that gave me problems. I tried making the same triangle, but it just wasn't working for me. I'm still in hat and scarf mode. I made several hats, now I have to make scarves to go with them. Once I do, I'll post the pics.